This page relates to Wood Quay Sessions 2018. It will be updated in May 2019. 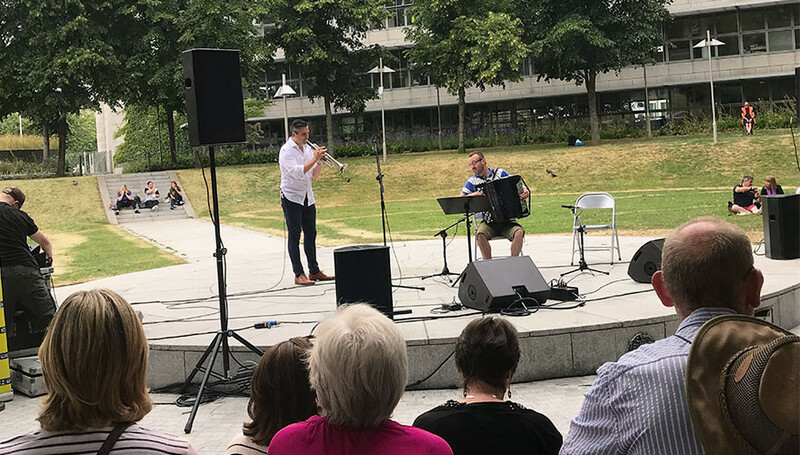 The Wood Quay Summer Sessions, run by Dublin City Council, are a series of free lunchtime gigs that take place every Thursday in July from 1-2pm in association with First Music Contact (FMC), Improvised Music Company (IMC), Music Network and Contemporary Music Centre (CMC). 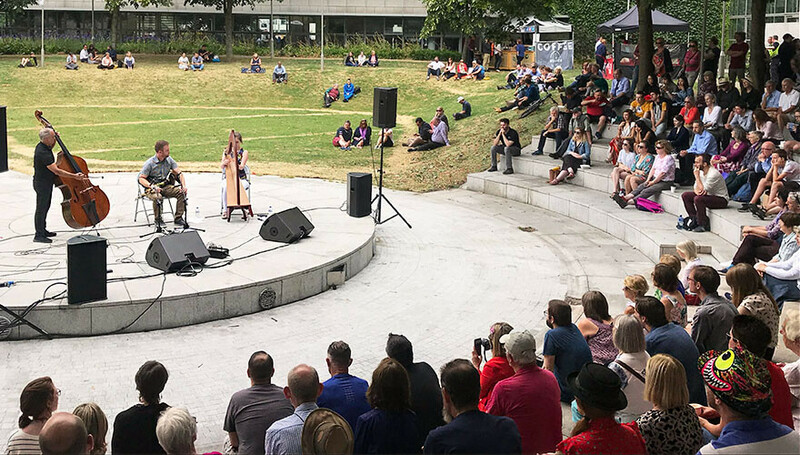 It all kicked off on Thursday 5th on what felt like the first grey day in months but, there was no gloom to be found in the Wood Quay Amphitheatre. As a gentle breeze blew, visitors flowed in to see the show. There was a varied crowd with everyone from toddlers to experienced culture vultures taking a seat for the concert. Some came prepared with blankets, cushions and packed lunches while some seemed to just happen across the event, most likely drawn in by the music. The gig started with the unlikely pairing of trumpeter, Niall O’Sullivan and accordionist, Dermot Dunne. They opened the show with a number familiar to most, The Godfather theme tune, before playing a few more traditional numbers. They were a pleasure to watch. Dunne seemed to feel every note with his entire being, his face and body playing to the melody as much as his accordion, while it was plain to see that O’Sullivan was having a great time. The second act of the afternoon dubbed themselves the “Wood Quay Trio” and featured double bassist Paul O’Driscoll, harpist Eilís Lavelle and uilleann piper Mark Redmond. The group had been “thrown together for this gig” according to Redmond, but you couldn’t tell. They were perfectly in sync, their toes all tapping out the same rhythm but in their own individual ways. O’Driscoll was tapping his right toe double-time while Redmond’s right heel kept pace and both of Lavelle’s feet marked alternate beats. Redmond was a fantastic storyteller, giving the background to every tune. One had been hidden in a book (gathered to prevent the loss of music after the famine) in the library of Trinity College for over 100 years. When they finished, the man beside me turned to me and said, “Thank God they got that book out of the library”, he spoke for all of us. The Wood Quay Summer Sessions continue every Thursday in July from 1-2pm. Over the next couple of weeks, five more acts will take to the stage. Entry is free to all, and the area is well served by Dublin bus with stops on both the quays and nearby Lord Edward Street. To learn more, visit the DCC event page.